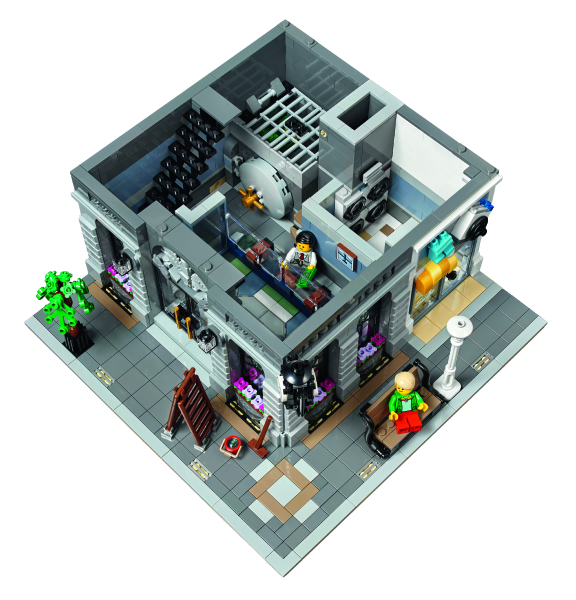 With its sand green patina windows, nifty interior details like a big safe and banker’s desk and lamps, and a neighboring building housing a laundromat, the newest modular set in the Creator Expert line is the Brick Bank, #10251. 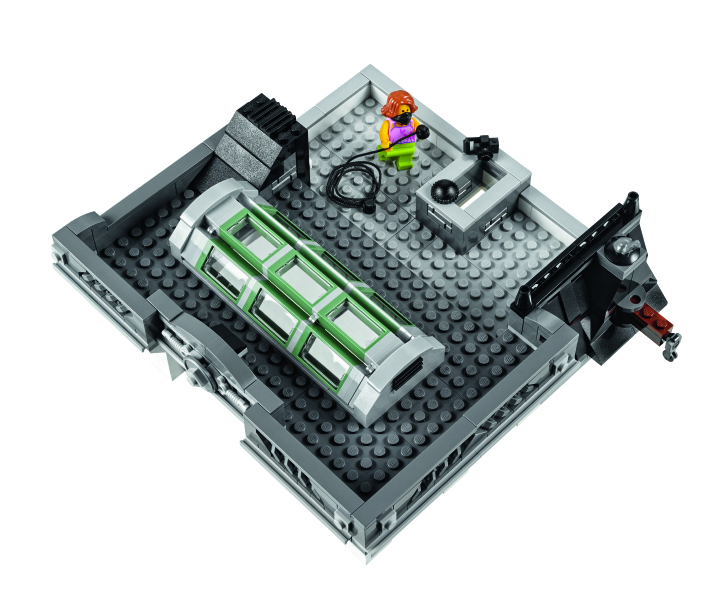 Planned release is January, 2016; it will be posted as a “Coming Soon” item on shop.LEGO.com on Oct. 12. It will cost your $169.99 — a new, higher price point for a Modular. 😦 But it really looks like a beautiful set and will probably become a fan favorite. Enjoy these photos, followed by the text of the LEGO press release. décor, decorative roofline, large arched windows, central balcony, clock and an accessible roof terrace featuring a large skylight. 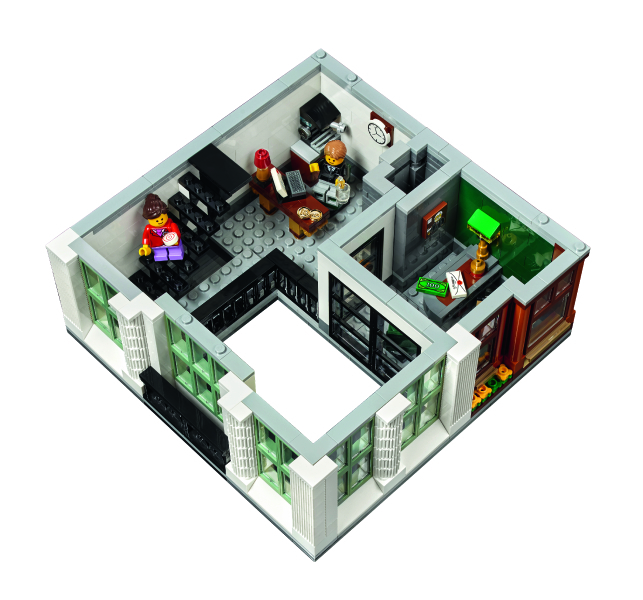 • Includes 5 minifigures: a bank manager, secretary, teller, and a mom and child. 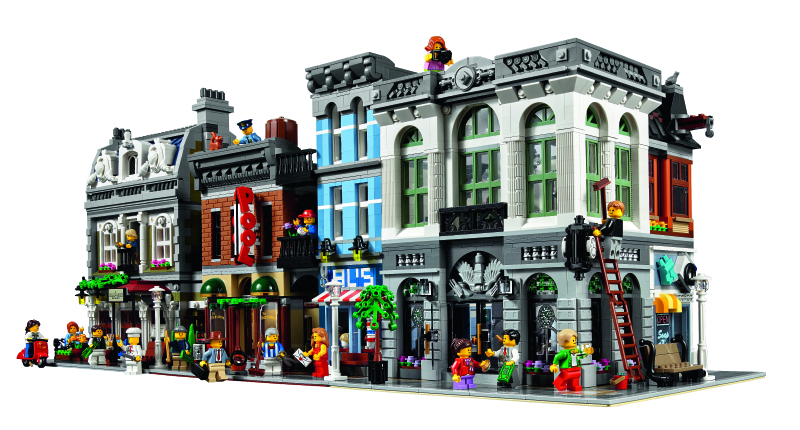 • The Brick Bank features a bank, secretary’s office, bank manager’s office, laundromat and a detailed façade and sidewalk. • Bank features an atrium foyer with wide, arched entrance, triangular-patterned floor tiling, ornate chandelier, oxidized-copper colored skylight, trans action counter with hidden alarm buttons and security glass, and a bank vault with safe deposit boxes and a large round door. • Laundromat features a printed window, tiled floor and 4 laundry machines. • Secretary’s office features a wall clock, desk, typewriter, cabinet with opening drawers, fireplace and an espresso machine. • Bank manager’s office features a large desk with banker’s lamp and approval stamp, leather-look chair, printed portrait, statue and a cabinet. • Accessory elements include a mug, document, camera, candy, blank white paper, chrome-golden coins, 1 chrome- golden bar and banknotes. 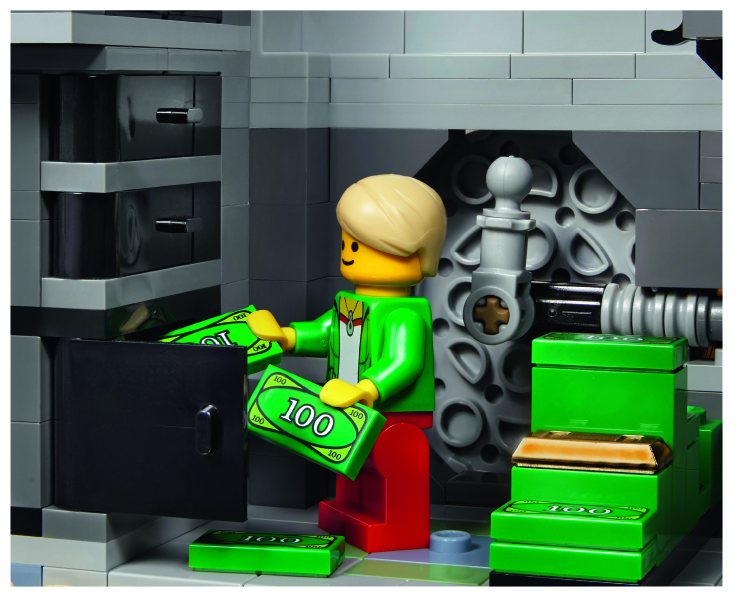 • Unlock the bank vault to access the safe deposit boxes. 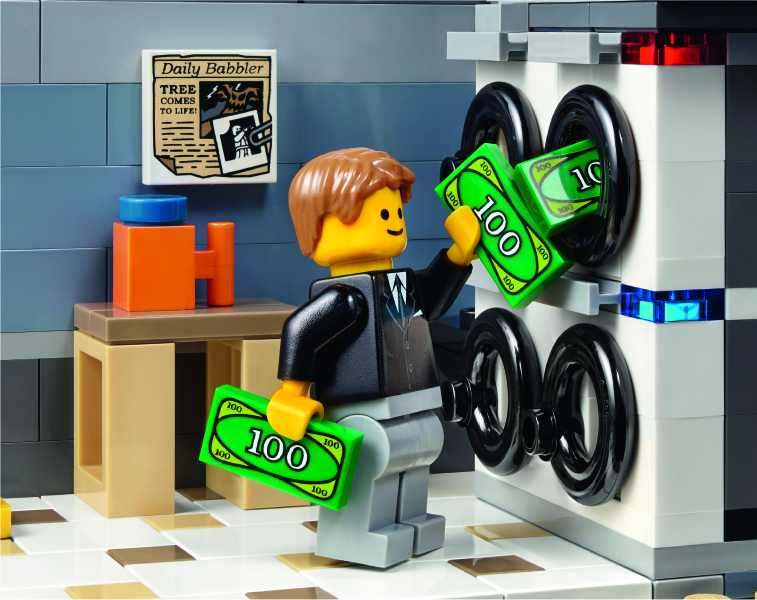 • Visit the laundromat for a spot of laundering. • Stack coins with the coin counting machine. portrait in the bank manager’s office, plus rare, sand-blue and dark-green bricks, and sand-green window frames. 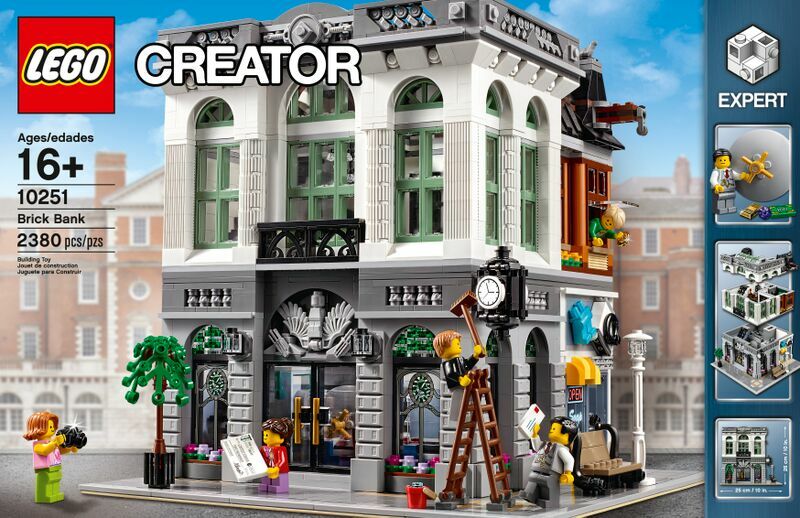 • Collect and build an entire town with the LEGO® Creator Expert Modular Building series 10243 Parisian Restaurant and 10246 Detective’s Office. An inspirational building technique — not to mention a great gag to pull on April Fools day! We’ve just updated our Members page with some short bios on your fellow NYCLUGers. Please check it out and remember, feel free to email us: join (at) nyclug (dot) com! 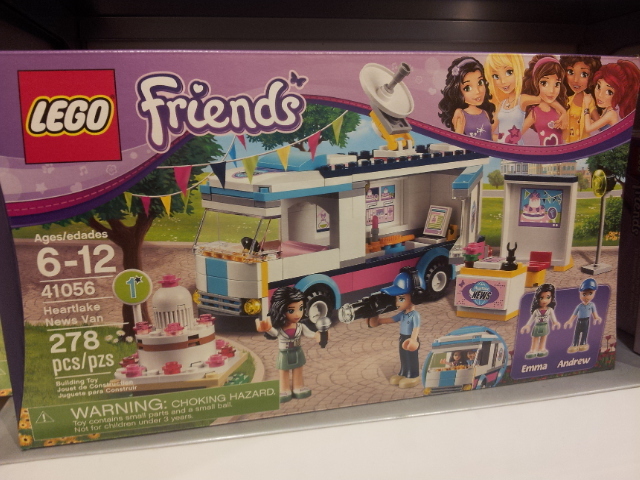 Next Up: New Friends and Junior Sets! The news comes to LegoLand via this nifty new TV news set, complete with a broadcast truck and anchor desk. 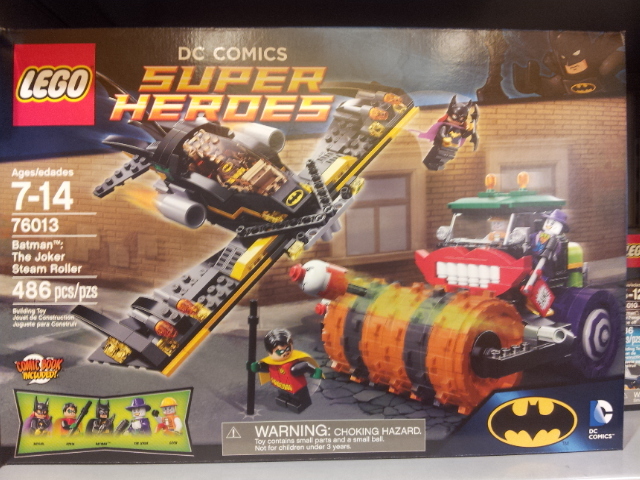 New Sets at LEGO Stores! 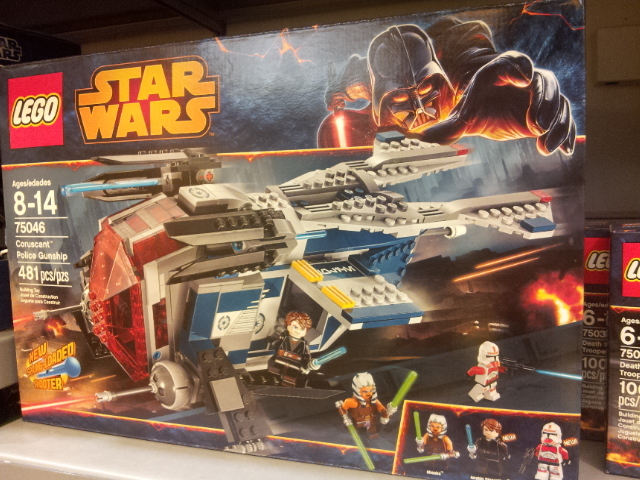 With the success of The LEGO Movie it looks like the company is taking advantage of the heightened PR for the toy line and releasing a ton of new 2014 sets early. NYCLUG NEWS, New Year’s Day Edition! 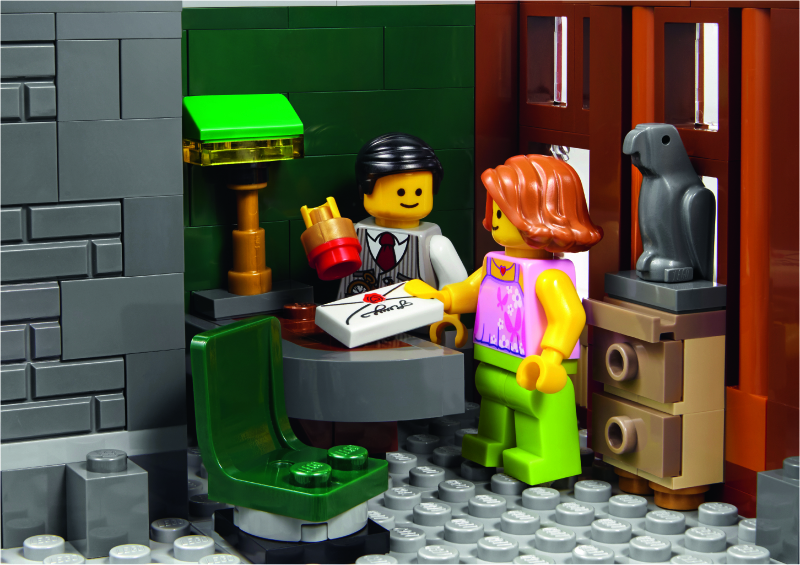 First founded in the mid-aughts, NYCLUG — the New York City LEGO Users’ Group — brought together like-minded Adult Fans of LEGO, or AFOLs, who lived and worked in the five boroughs of New York City. We held two or three meetings before disbanding, simply because it was difficult to get our schedules coordinated. But as we’ve entered an era dominated by social media platforms like Facebook, Twitter and Instagram, along with other online resources such as blogging and even Google Hangouts, NYCLUG is now able to adapt itself to be less burdensome on its members, while still allowing us as a LUG to flourish and bring notice to the great works done by its members. And so, NYCLUG is formally reborn! NYCLUG comprises members who either LIVE or WORK in any of New York City’s five boroughs (Staten Island, Queens, Brooklyn, Manhattan and the Bronx), or who are “legacy” members — that is, original members of NYCLUG from when it was first established years ago. We have received formal recognition as a LUG by The LEGO Group and, to date, comprise ten members from in and around New York City. As stated, NYCLUG will primarily live online, but we will hold a handful of in-person meetings during calendar 2014 and beyond. We will be codifying membership rules and will issue them in early 2014. If you are age 17 or older and want to inquire about joining NYCLUG, please send an email to NYCLUG (at) Gmail. You can also find us on Facebook or Twitter. Leg godt and happy new year!